It’s a good time to be a tech worker. Between 2013 and 2014, even as job and income growth in the rest of the economy was sluggish, overall employment in technology grew by 3.7% and average annual technology incomes increased by 2.4%. Today, there are 3.8 million tech jobs in the United States, paying an average of $83,970 annually. 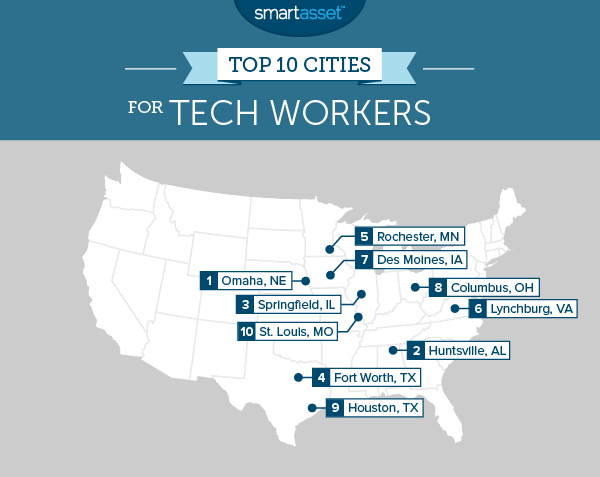 This is SmartAsset’s second annual study of the best cities for tech workers. Read 2014’s study here. At the same time, traditional tech hubs on the west coast have become so expensive that they are increasingly only affordable a narrow slice of the tech elite. For most workers in technology fields such as network architecture and information security, better financial and professional opportunities await elsewhere. So where do tech workers today have it best? Omaha tops the list. For the second year in the row, Omaha ranks as America’s top tech city. Even with the addition of new metrics that capture unemployment and overall tech income, Omaha maintains its position as a top city for tech jobs. Steer Clear of Silicon Valley. While Silicon Valley and the rest of the Bay Area are generally considered the world’s tech Mecca, the truth is most tech workers would be better off living elsewhere. The cost of living in San Francisco (which ranked 130th in our study) or San Jose (100th) is more than 50% higher than the national average. In both cities, the housing costs, whether you’re buying or renting, are prohibitive. These high costs will eat away at the money you can put toward retirement. Midwestern cities are great for tech workers. Six of the top ten cities for tech workers are located in the Midwest. These cities match low living expenses with a high demand for tech workers. To find the best cities for tech workers, we collected data on tech employment and living expenses in 230 of the largest U.S. cities. In our 2014 study, SmartAsset considered three metrics for each city: the cost of living, the ratio of the city’s median tech wage to the overall median wage and the percent of the workforce employed in tech. After gathering data on these five metrics , we then ranked each city according to each metric. We averaged those rankings and calculated a score based on the city’s overall average in comparison to the other cities in our study. Scores range from 0 to 100, with the top overall city receiving a perfect 100. Omaha may not be the first city that comes to mind when you hear “tech hub” but for the second year in a row it ranks first in SmartAsset’s study. 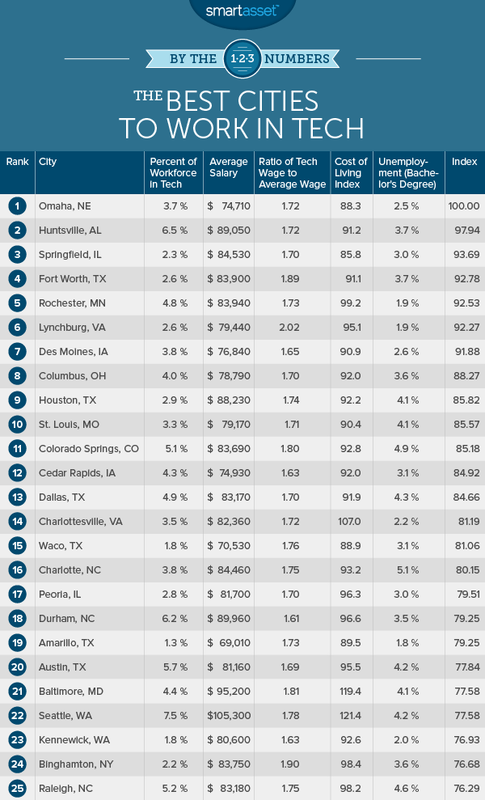 So what makes Omaha a top tech city? For starters, it’s very affordable. According to the U.S. Census Bureau, the cost of living in Omaha is 11.7% lower than the national average. That’s great for tech workers and for new businesses trying to maintain a low overhead. Compare that to cities like San Francisco and San Jose, where the cost of living is 64% and 56% higher than average, respectively. Want to buy a home in Omaha? Find a mortgage here. Secondly, the economy in Omaha is booming. The city’s overall unemployment fell to 2.7% as of April 2015. That is lower than the level economists consider to be “full employment,” which is reflective of an economy that is growing quickly and generating lots of new jobs. 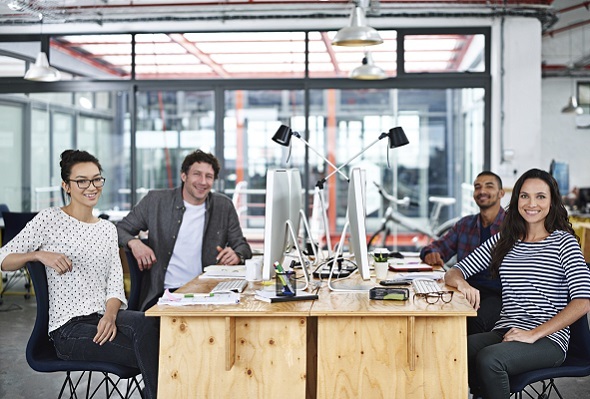 In that employment environment, there are lots of opportunities for workers in tech. As home to a number of the nation’s most important military and aerospace research centers, Huntsville serves an out-sized role in U.S. tech development. While the city itself has a population of just 180,000, there are more than 13,000 tech workers in the metro area. That is comparable to the tech workforce in significantly larger southern cities, like Louisville and Jacksonville. Huntsville’s low cost of living is a major draw for workers in the technology. For example, tech workers in Huntsville earn more on average than do tech workers in the Los Angeles metro ($89,050 vs. $88,940), despite facing a far lower cost of living (91% of U.S. average vs. 136%). Springfield is the capital of Illinois and the sixth largest city in the state. The city’s largest employer is, unsurprisingly, the State of Illinois. Tech workers in Springfield earn nearly $85,000 dollars a year, on average, while facing a cost of living that is more than 14% below the national average. That means every dollar goes a lot further. For example, the median home sales price in Springfield was just $122,000 in 2014, according to the National Association of Realtors. Replacing Dallas in the number four spot from last year’s study, Fort Worth has ties to a number of major military contractors. (Dallas ranked 13th this year.) Lockheed Martin Aeronautics is the largest employer in the city, with over 13,000 employees in the Fort Worth area. Other major employers include American Airlines and Bell Helicopter. Tech workers in Fort Worth make an average annual salary of $83,900. One reason tech workers might prefer Fort Worth to someplace in, say, California or New York? Texas has no state income tax. Rochester’s Mayo Clinic is one of the world’s top medical treatment and research facilities, employing many top-flight doctors and drawing an international clientele. The Mayo Clinic employs over 35,000 people in Rochester, while the city’s second largest employer is IBM. According to the Bureau of Labor Statistics, there are about 5,000 tech workers in the Rochester area, composing nearly 5% of the workforce. As the medical field increasingly relies on computers and technologists for everything from diagnosis to new drug development, the tech workforce in Rochester will likely continue to grow. With a city population of about 80,000 (and a metro area population of 250,000), Lynchburg may be the perfect place for tech workers seeking a small-town environment. The unemployment rate for workers with a bachelor’s degree in Lynchburg is just 1.9%, 17th lowest of any city in our study. Tech workers in Lynchburg are in especially high demand, as they earn more than double the city’s average income. After ranking 15th in last year’s study, Des Moines moves up to take the 7th slot in 2015. Why the improvement? For starters, tech is growing quickly in Des Moines. According to the Bureau of Labor Statistics, the city added over 700 tech jobs in 2014, increasing its tech workforce by nearly 6%. Des Moines also has a notably low unemployment rate for skilled workers. Just 2.6% of people with a bachelor’s degree are unemployed in Des Moines. For the second year in a row, Columbus ranks as one of the top tech cities in the U.S. Thanks to the presence of Ohio State University and the Ohio Supercomputer Center, Columbus will likely remain a hub for technology research and education for a long time. Tech professionals in Columbus also enjoy a cost of living that is 8% lower than the national average. With over 80,000 tech workers in the Houston area, Space City is one of the country’s largest tech hubs. Energy and aeronautics are the city’s foremost industries, but biomedical research is emerging as a major part of the Houston economy as well. In all, there are some 24 Fortune 500 companies headquartered in Houston. This is more than all but five states (including Texas). St. Louis has a number of organizations and resources that make it a great destination for tech workers and companies looking to escape the coasts. TREX is a tech incubator and co-working space located in downtown St. Louis. LaunchCode is a St. Louis-based nonprofit that helps train new tech workers and connect them to good apprenticeships and jobs. Cultivation Capital and Six-Thirty are venture capital firms that have invested in St. Louis’s growing crop of tech startups. All of these institutions have helped grow the tech scene and workforce in St. Louis in recent years. Today, there are over 40,000 technology workers in the St. Louis metro area. 1. Data on the median income, the income ratio and the percent of workforce in tech comes from the Bureau of Labor Statistics. Data on the unemployment rate and the cost of living comes from the U.S. Census Bureau’s American Communities Survey.